Not all bacterias cause tooth decay. The bacteria that can cause tooth decay are simple sugars. They like to live in an acidic environment, which we can accidently create for them by drinking delicious things like juice, soft drink, wine, etc. with too much frequency. Preventing tooth decay is as simple as brushing and flossing regularly. The most important time to brush is just before sleeping at night, as our bodies natural protection against tooth decay (our saliva) turns off while we sleep. 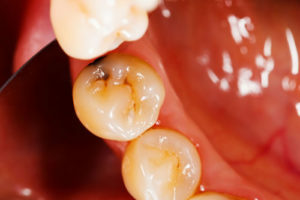 Decay left untreated can lead to root canal infection.